I have commented before on the fact that churches seem to have survived pretty well here in Brisbane. Most of the ones that we have seen earlier in these pages have been substantial works of brick or stone, but here is a tiny wooden church that has survived, despite several attempts to kill it off - from both nature and man. The first Anglican Christ Church at Tingalpa was established in 1868 to a design by RG Suter, but that building was destroyed by a cyclone in December of 1885. 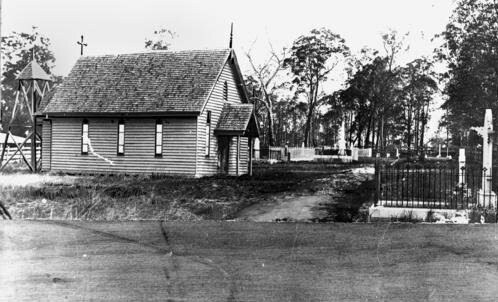 Jackie Butler, in the publication "Sites of Separation" published by the Brisbane History Group, records that the Brisbane Diocese of the Church of England had decided not to rebuild the church, but the church community resurrected most of the timber after the cyclone and the church was rebuilt on a smaller scale in 1886. Here is a picture of it from 1906. However, one hundred years later, declining attendances led the Church of England to declare the little church redundant and so started to demolish it in 1996. Once again, the local community had other views and sought to have the church heritage listed. They formed a group to restore the building, and this is the way it looks now. One of its features is the old burial grounds - the first recorded interment there is that of Susannah Weedon of Cannon Hill in 1868. The immaculate church and cemetery are situated on busy Wynnum Rd, surrounded by all sorts of industry. The building, now called the Pioneer Wedding Chapel can be reserved for weddings and other ceremonies, and its very existence is a testament to people power spanning more than a century. Congratulations to you. Jackie Butler and the group 'Friends of Tingalpa; Pioneer Cemetery' did an amazing job in saving the church. Each year my husband and I go to their fundraising dinner, as a cousin of ours, on her father's side,is related to a pioneering family whose members are buried there. Great post thank you!